The man who gave late-night talk radio listeners across the country the jitters by way of engaging in conversation about everything paranormal is returning to the airwaves next month. Bell, who will return to the microphone on Sept. 16, told the Pahrump Valley Times this week that the decision to come back to radio was not a very difficult one to make. “That’s easy, because I love it. It’s my life and that’s all I have ever done. I went through a lot of family problems so that interrupted things and I was overseas for four years and that certainly interrupted things. I went back into radio because I love it,” he said. Bell founded Pahrump’s own KNYE 95.1 FM. where he broadcast the very popular Coast to Coast AM for years. The late night program was an audio beacon for listeners, callers and guests who shared stories and spoke about such subjects as UFOs, ghosts, near-death experiences and all things creepy and crazy. After founding KNYE, Bell retired and returned to Coast to Coast AM more than once. He noted that this time around, he is looking forward to broadcasting on a new uncensored medium and the newfound freedom it offers. “I was never prone to bad language anyway, so if it’s a matter of language and some guest of mine utters an exclamation, I will let it go through because it doesn’t matter and we are not controlled by the FCC in that sense. It’s kind of like being on cable versus broadcast TV but I don’t use a lot of bad language anyway so it’s not really an issue for me. What is an issue is the freedom and the unstructured nature of Sirius XM. We don’t have as many commercials obviously and you can get a lot more content in,” he said. Bell also said that traditional terrestrial radio has been undergoing some major changes over the years, which has altered the industry. “Right now, radio has consolidated to the point where only a few really major networks can exist and you have to be on one of those unless you want to do something like Sirius XM, which is one big honking signal that covers every inch of U.S. soil and Canada, Puerto Rico, and down into the southern hemisphere. It covers everything. Plus, the amount of freedom they are affording me is tremendous. I will do it live from 7 to 10 or 11 p.m. and that’s what I mean by ‘unstructured.’ Technically it’s 7 to 10 p.m. at night Monday through Thursday. If I want to do 7 to 11 p.m. or show up on a Friday because there’s some big breaking news, I can do all of that. It’s not quite the same as broadcast media,” he said. For those whose work schedule conflicts with the live show, Bell said that there will be ample opportunities to catch it at another time. “Sirius XM will literally repeat my show all night long. It will be 7 to 10 live, 10 to 1 a.m., 1 to 4 and so on. It will be on all night long which is pretty convenient because if people are driving they can pick it up. Sirius XM is also available on your computer or on your Smart Phone by subscription. You can get an app for it and listen on your phone or computer anywhere in the world, but it won’t be on KNYE of course,” he said. The legendary broadcaster also said that his new radio program will mirror the content and format of his previous show. Asked how he came up with the name for his show, Bell said it just made sense. “Dark Matter is a pretty cool name. Dark Matter is probably the single most prolific substance in the universe. It makes up about 60 to 70 percent of everything. It also works the other way. The things that I discuss are frequently dark and I thought that it was a cute name,” he said with a laugh. Listeners to Bell’s Coast to Coast AM were regularly put at ease with his resonant voice, calm demeanor, and sheer knowledge on a myriad of topics and subjects. Bell himself admitted that the popularity of his show and its content over the years inspired other broadcasters to delve into subject matter that was considered unique at the time and has since crossed over to other mediums. “When I began, I was one of the only ones doing it or maybe the only one. Since that time the evidence for the interest in paranormal is everywhere. Look at the TV shows, the movies and the books that are coming out. It is everywhere and if anything it’s very much increased since I was on the air,” he mused. Bell also provided his thoughts on how KNYE and its present owner Karen Jackson have fared since he left several years ago. “The whole idea for KNYE when I filed for the license originally was to have a local station that caters to local needs and that is exactly what she has done. When you listen to KNYE, you get a lot of local information. Karen does a lot of interviews with local politicians and business people and on and on. She’s totally got the spirit of what I wanted for KNYE and I am very satisfied because she is doing exactly the right thing,” he said. On Wednesday, Jackson provided high praise for Bell’s re-emergence. “I think it is awesome. There really is nobody better than Art Bell on the radio. He is a legend among legends, but I don’t look at him that way because he’s my friend. Sometimes it overwhelms me with the publicity that he gets. I look at him as Art while the world looks at him as Art Bell. The way he has been publicized over the last few days, it really reminds me of what a true legend he is,” she said. Talk Show Host George Noory became the permanent host of the Coast to Coast AM program on Jan. 1, 2003, following Bell’s semi-retirement. Though they are not in direct conflict in terms of scheduling on the radio dial, Bell said there will still be a bit of competition between the two when he opens his mic next month. “It’s not going to be live competition, but of course there is competition in the sense that my re-broadcast will be on during his hours. So there is an element of competition but there is no direct live competition,” he said. Bell said the agreement with Sirius XM came about after he was contacted by a representative of the satellite radio company via social media. It was not the first time he was approached by radio industry officials to return to the airwaves. “Two terrestrial networks, which I won’t name, approached me and I turned them both down. I later got a Facebook message from a fellow named Jeremy Coleman, who is the programming manager for Sirius XM. We connected and talked. The more we talked, the more it seemed logical. That’s how it happened. He approached me and after turning down a couple of big networks, I said ‘this would be fun.’ I really like the technology. I’m thankful to be back on the air,” he said. Jackson, meanwhile, said Bell will soon appear on KNYE to talk about his return. 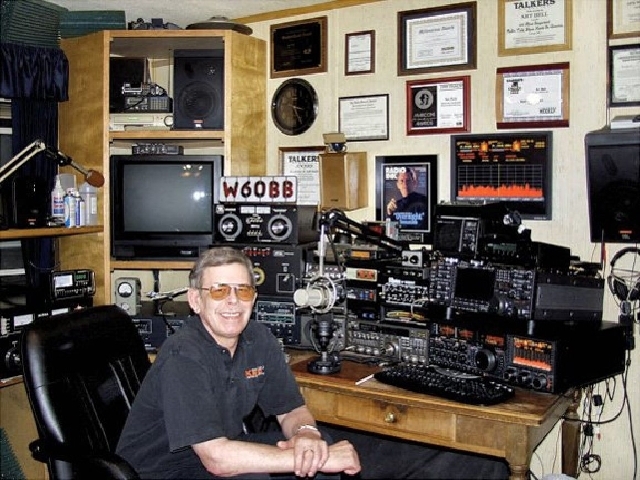 At present, Bell is now readying his home studio for the upcoming maiden broadcast of ‘Art Bell’s Dark Matter’ on Sirius XM channel 104. “There are still a lot of things to be done,” he said.